Okay, call me satirical, or a critic, or even a grinch, but there is one Christmas decor fad that I simply cannot find permissable. 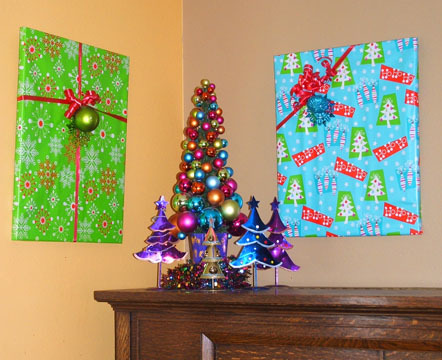 And that is: picture frames, or wall art, wrapped in wrapping paper with a bow, and then hung back on the wall. Even as a child, I've often wondered if these people that commit this atrocity, wake up on Christmas morning, and unwrap their wall-art-gifts, surprised to find the same art that they had wrapped over a month ago. I wonder if these people feel a sense of awe, or incredibly lame- I'm voting for the latter. My deepest Christmas philosphy is that gift wrap belongs on the gifts. And that's it. Merry Christmas.